THE STORY - From the largest elephant to the smallest shrew, the city of Zootopia is a mammal metropolis where various animals live and thrive. When Judy Hopps (Ginnifer Goodwin) becomes the first rabbit to join the police force, she quickly learns how tough it is to enforce the law. Determined to prove herself, Judy jumps at the opportunity to solve a mysterious case. 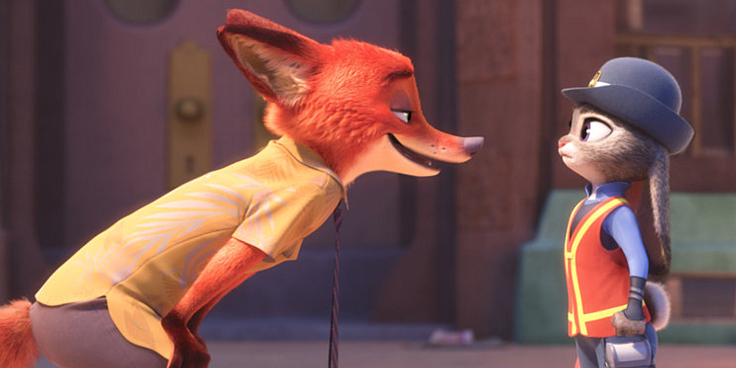 Unfortunately, that means working with Nick Wilde (Jason Bateman), a wily fox who makes her job even harder. THE GOOD - A complex, deep and incredibly relevant screenplay helps to make "Zootopia" one of Disney's best efforts. Perfect voice casting (Especially Bateman) and some of the best animation the studio has ever delivered. THE BAD - A sluggish middle section with some unfunny jokes. Walt Disney Animation Studios has a proven formula that works for them in their feature length films. The main protagonist is someone who we easily identify with and overcomes great odds, all the while achieving their inner potential by the film's conclusion. It creates that "feel good" Disney ending that we have come to know and love. "Zootopia" still follows this formula, but it does a heck of a lot more by digging a lot deeper beneath the surface to examine not just personal issues for its protagonist but sociological issues that inhabit the world the protagonist lives in. It not only creates one of the best-animated films of the year, but a culturally relevant one that the all-powerful animation studio can hold up proudly as one of their greatest triumphs. ​Judy Hopps (An energetic Ginnifer Goodwin) is a bunny that never quits in her determination to become a cop despite the overwhelming odds that are in front of her - mainly, that she is very small compared to the other animals that populate the world. After graduating top of her class, she is sworn in as an officer of the law for Zootopia, which stands in as the great city for all animals to live in peace and harmony. Despite overcoming years of biology which would pit predators against prey, Zootopia is a city where tigers go to work alongside elephants, sheep, giraffes and every other animal you could imagine. Judy is idealistic in her hopes but is eventually forced into a seemingly near impossible missing animals case of finding a missing Otter. With the help of a sly small time con artist fox named Nick Wilde (Jason Bateman), Judy will have to prove to her superior, Chief Bogo (Idris Elba), and to the rest of the population of Zootopia that she has what it takes to uphold her commitment "to protect and serve." There is so much to unpack in "Zootopia" that it is not only delightful but inspiring to see an animated Disney studio film cram so many different themes into its narrative. As said before, Judy is an idealist who is constantly being told that she cannot achieve her dreams, that she should give up, and that she can't hope to make a difference in a city that may or may not be destined to rip itself apart. While children will respond well to the themes of Judy overcoming such barriers, adults will respond (Get ready for this) to the messages of xenophobia, racism, prejudice, bigotry, sexism and the systems that are put in place to not bring these beliefs down, but uphold them. It's the most timely animated film I have seen in quite some time and the fact that the film never teeters over the line in laying down the messages of the film too heavily upon its adult audience is a masterstroke from the storytellers at Disney. The serious subject matter is wisely hidden beneath the vast array of colorful characters, wonderful voiceover work and entertaining bits of humor. One scene involving Judy and Nick taking a trip to the DMV where they are forced to wait for an excruciating amount of time due to the slowness of the Sloths who work there is not only relatable but gut-burstingly funny. This scene had me laughing harder than I have in recent memory because of how wisely the creative thinkers at Disney are able to place our society under a microscope and scrutinize it with hysterical results. But don't be fooled. That scrutiny is also condemning us and serves as a warning for how we have been, how we are, and how we are destined to be. Only when we take it upon ourselves to ignore the status quo and ignite real change can we make a difference in our society. I can't remember the last time I had so much to chew on after watching a Disney film. It's not only an important story exploring vast sociological issues, but it's also a detective story, a buddy cop film, and an inspiring movie of holding onto your dreams in overcoming great odds. The carefully laid out screenplay not only presents all of these genres and themes but also lays out a lot of foreshadowing and great character work, which helps to bring everything full circle. If I had one complaint it is that the film is a tad bit overlong for a children's film. However for us adults, when there is so much narrative to unpack wrapped in enormous amounts of complexity, I think the artists and storytellers at Disney not only deserve your time and attention, but they also deserve a response from us to start thinking differently about the way we treat each other despite our gender, race, creed or culture. After all, we too are animals living in our very own Zootopia.